Cool detachment and dreamy romanticism make an odd couple. But despite their different approaches to relationships, Aquarius and Pisces are both non-conformists. Is their shared existence outside the boundaries enough to make this relationship work? Venus in Aquarius enjoys the attentions of a lover as long as she is free to be herself. She is chilled-out and amicable until her independence is threatened. Ms. Aquarius will meet controlling behavior with stubborn resistance or light-speed detachment. Cozy, domestic scenes are not her thing, but in the right relationship she can be loyal and extremely tolerant. Many are surprised to discover that Venus in Aquarius is an idealist who finds the best qualities in her partner. No matter how bitterly the romance ends, Aquarius can remain a lifelong friend. 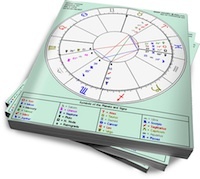 Mars in Pisces is the passionate, gentle lover who loathes aggression. Dreamy and sensitive, he oozes romance but is more of a poet than a knight in shining armor. He is not grounded in reality, therefore much of what he offers is an idealized version of the truth. It’s difficult for him to confront or commit, because setting boundaries does not come naturally. But his lack of boundaries can have Mars in Pisces sacrificing everything for a certain partner (not always the one he is with). The mutual fascination between these two can be strong. They’ll feel they have found a kindred spirit in each other with their mutual dislike for boundaries and convention. Each will initially view the relationship in an idealized light. This combination is a tough sell, but it can work if each party is willing to be realistic from the start. Mars in Pisces must realize that Aquarius will never be as emotional as he is. Venus in Aquarius must realize that Pisces will always want a bit more than she can give. If they can apply their mutual tolerance of differences to each other, they can create a beautifully unconventional relationship.